Pictured, left to right: Hon. Kristen A. Lucena, Butte County Superior Court; Casey Taylor, Achieve Charter School Executive Director; Achieve Charter School students Michelle Tippets, Ella McDonald, Taylor Scarbrough and Analyssa Sundstrom; Tim Taylor, Butte County Superintendent of Schools. 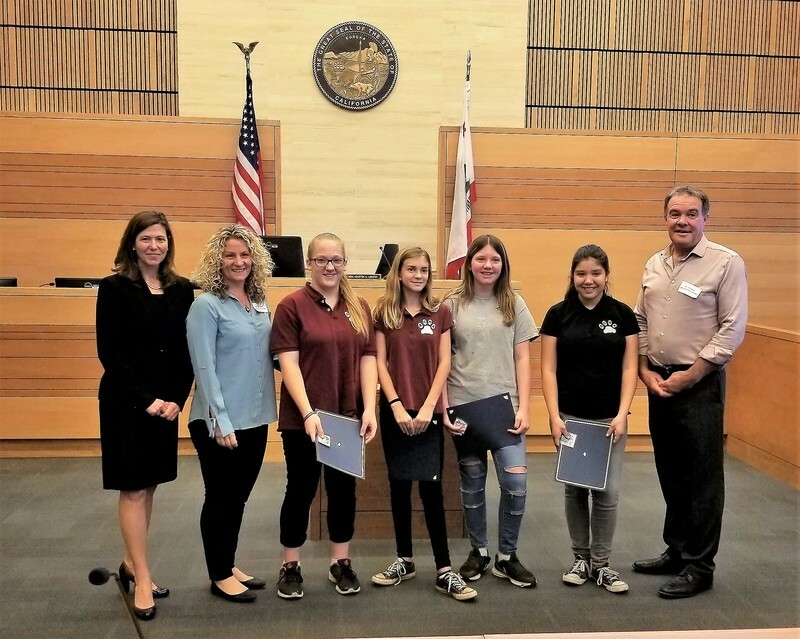 On December 7, 2017, Achieve Charter School Students shared their National History Day project experiences with the California Civic Learning Partnership (CCLP), Butte County at the North Butte County Court House. CCLP is part of the Power of Democracy Steering Committee under the honorary leadership of California State Supreme Court Chief Justices Tani Cantil-Sakauye. The Power of Democracy Steering Committee works together to improve civic awareness, learning and engagement in California. The committee includes representatives from all three levels of the California courts (Hon. Kristen A. Lucena) as well as state and local education organizations (Butte County Office of Education).